HP: “Struggling to find a parking spot before their son’s football game, Dad suggests looking elsewhere. Thankfully Mom wears the pants. 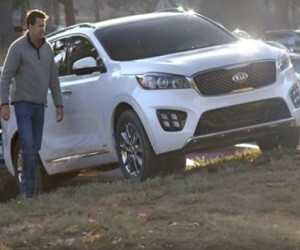 Using the Kia Sorento’s all-wheel drive, she finds the best parking. No matter what kind of season your team is having, the Kia Sorento is the perfect crossover SUV for your football family”. We should park back there baby. Great idea, hadn’t thought at that. Let’s just park back in our driveway. Or.. we could.. I don’t know.. run it right up the gut. Someone’s gotta wear the pants in this family.